Natural Import Company - Traditional Japanese foods - Mitoku Ginger Powder - 1.76 oz. 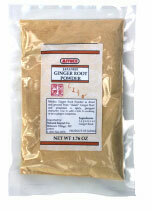 Mitoku Ginger Powder - 1.76 oz. Ingredients: Japanese dried wild ginger root. Mitoku Ginger Root Powder is dried and ground from "Asian" ginger root and possesses a spicy, pungent character. It may be used in cooking to add a bite or used externally in a bath or as a ginger compress as it stimulates blood and body fluid circulation and dissolves stagnation. A ginger compress using this special ginger makes the skin warm and acts as a natural antiseptic before and after using albi.